This is what a had for lunch today! It was a nice, light and healthy salad. I cheated a bit by using bottled black bean sauce. If you are a purist you could probably substitute in any type of sauce. Cook up the pasta and drain. Mix in a bit of black been sauce (not too much as the noodles are thin and easily flavoured), flax oil and some sesame seeds. Leave aside to cool a bit. Line your bowl with lettuce leaves. Chop up the red pepper and green onion. 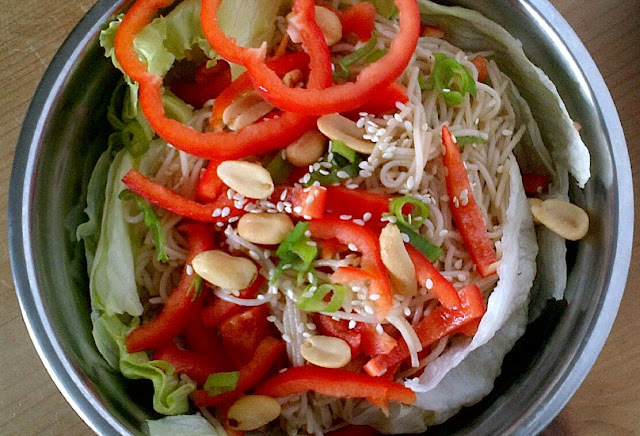 Place your noodles in your lettuce bowl and top with the red peppers, green onions, peanuts, a few more sesame seeds and salt n' pepper. Enjoy!